Hillary’s recent comments about charter school equity and inclusion have sparked a conversation about America’s public schools. It’s an important debate — one we should be having — for our kids’ futures and for our country’s future. So let’s cut right to the chase: For decades, Hillary Clinton has been a strong supporter of both public charter schools and an unflinching advocate for traditional public schools, their teachers and their students. She knows that all public schools play a role in providing pathways for every child to live up to their potential. This isn’t anything new. She’s been saying it for decades. Hillary believes that every public school should be serving our students and supporting our teachers. And when charter schools are producing results, she believes we should double down on their success by scaling the model and ensure that their innovations are widely disseminated throughout our traditional public schools. That was the original bargain of charter schools. Ensuring accountability and transparency is hard work. But those concerned about leaving students in failing traditional schools should be just as concerned about leaving kids in failing charter schools. This may seem obvious, but the evidence for accountability is clear: closing charter schools for poor performance contributes to improved student outcomes. Hillary also raised concerns about students with disabilities and their access to charter schools. The National Center for Special Education in Charter Schools recently found an ongoing enrollment gap of students with disabilities in charter schools compared to traditional public schools. Why the enrollment gap? Currently, there is no widely accepted answer. Some of the disparity may be attributable to charters counseling out students with disabilities. However, some of the disparity may be the result of parents of students with disabilities wanting to enroll their child in a known program in the traditional public school or keep their child in a consistent environment. In that case, you may be less likely to choose a charter in the first instance or move them to a charter in the second. But there’s good news. 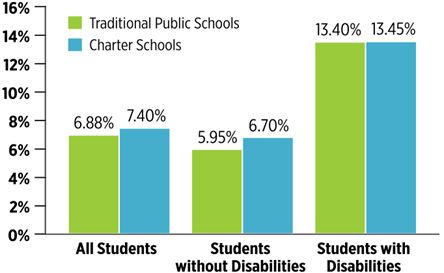 The gap between the percentage of students with disabilities in charter schools versus traditional schools is decreasing. Just this week, we learned that between the 2008–09 school year and the 2011–12 school year, the gap shrunk by nearly 60 percent. That represents real progress, but that’s just a national average. It masks larger disparities in some districts. That is why Hillary recognizes that we have more work to do to ensure that every charter school is open to every child. Finally, recent accounts have raised concerns that some charters are suspending and expelling students at higher rates than traditional schools. News accounts have been filled with disturbing data and anecdotal evidence of much higher suspension or expulsion rates for charter students than traditional public students in New York City, Chicago and Boston. Hillary believes that leaders across the country should be rethinking school discipline policies to ensure that removing a student from the classroom is the absolute last resort. Charters should be at the forefront of this conversation — experimenting and innovating to keep our students engaged. In Washington, DC, where charters were disproportionately suspending and expelling students two years ago, the charter community has worked hard to reverse this trend and there may be some important lessons learned from this improvement. Part of real leadership is naming hard truths and addressing them together. And in pointing out that charters suspend a disproportionate number of students — nearly 10 percent more than traditional schools — Hillary wants to start an important national conversation. Hillary’s comments were about asking hard questions of a movement she has and will continue to support. That’s real leadership — it is how we make our public schools stronger and it is how we ensure they live up to the potential of every child.